In 1950 the first Club Championship was inaugurated. Previously, the main events had been the Merchants Cup and the Spring, Summer and Autumn meetings. James Barlas, of Dunbar’s Barlas & Sharpe (solicitors) put up the trophy and the first winner was Pat Butler of East Linton. In an effort to stimulate both its golf and the Dunbar economy the idea of a Dunbar Golf Week was devised in 1952 by the town’s hoteliers and boarding-house operators. This proved an instant hit and included a popular professional tournament, the first winner being famous Irish professional Harry Bradshaw. Things were not all plain sailing financially, however; golf as a national sport seemed to enter a minor depression and in Dunbar, the most visible effect was that in 1957 the Castle Club and the senior Club finally dissolved most of the boundaries between them. In 1960 the Club parted company with its landlord of the last 100 years when the Duke of Roxburghe disposed of his entire Dunbar landholdings to the Portland Cement Company. Portland became the Club’s landlord and the major employer in the town as a huge quarry and distinctive kiln appeared south of the town. The Club was promised a secure future by Portland who made no end of generous offers of assistance. Along with its successor Blue Circle, the company proved vital to the Club in creating vital sea defences at strategic parts along the fragile shoreline. The 1960s saw a golden age in Club fortunes as the game’s popularity blossomed again. Visitor numbers to Dunbar soared each summer as the outdoor swimming-pool, cinemas and hotels attracted legions of holiday-makers from Edinburgh and the rest of Scotland. The effect was to generate funds for a clubhouse expansion and in 1968 Club captain George Low relaunched the Dunbar Golf Week, inviting stars Max Faulkner and Dai Rees to front a busy itinerary of lessons, competitions and social events. The Club decided in 1967 it was time to finally appoint its first full-time secretary and Gerald Kirkby took the seat. In 1962 the Club hosted the Scottish PGA Championship for a second time, the winner being Ryder Cup man Eric Brown. In 1968 the Club took the inaugural East Lothian Winter League title and hosted the Schweppes PGA Championship, which was won by David Talbot. The Club also hosted the 1970 Scottish Ladies (Close) Championship with the winner being Annette Laing(Aberdeen). In the 1970s a new generation of excellent players emerged from the Club ranks, including Ewen Murray, David Robertson, Craig Maltman and Jimmy Martin who all went on to professional futures. Not surprisingly, the Dunbar club took the 1972 Lothians team tournament and in 1973 the elusive County Cup was finally won at last. The historic team was Bill Gray, Jim Aitchison, Robin Little and Neil Fisher. In the 1970s Dunbar also hosted the Scottish Assistants’ Championship six times. The Club appointed Derek Small as professional to succeed Bill Paton in 1977 and he immediately began a programme of encouraging local youngsters into golf. Graham Wood was greenkeeper by now, having served his initial apprenticeship at Dunbar, and he would continue excellent service for the next 30 years. In 1978 the Club’s landlord changed to Blue Circle but there was no let-up in assistance to the Club. In 1983 this kindness proved vital when a savage North Sea storm smashed across the course to the Broxmouth Park wall itself and huge work was required to host the Scottish Boys championship in April. The club’s production-line of young talent continued with the arrival of Stephen Easingwood, John Huggan and John Grant, Stephen later being chosen as reserve for the 1989 Walker Cup team. In 1984 the Club was able to hold an Annual Pro-Am which became very popular and incorporated a Dunbar Professional Championship for several years. In 1976 the Scottish Amateur (strokeplay) Championship was held at Dunbar and again in 1985, with Colin Montgomerie being victorious. The same year ambitious plans were floated for the golf to expand into Broxmouth Park with a new clubhouse, using Blue Circle as partners and although discussions went on for some 10 years, the plans were not realized. In 1988 the Club was able to proudly announce that it had been awarded Final Qualifying for the Open Championship at Muirfield. This was so successful that Dunbar was re-selected in 1992, 2002 and 2014. In 1996 the Scottish Amateur Championship returned to Dunbar once more, the winner being Mark Brooks(Carluke). In 1990 Dunbar also hosted the British Ladies Amateur Championship, with the winner being Julie Hall. Dunbar has a long association with junior golf events; it has hosted numerous Scottish Boys Championships (including hosting the 2015 event), the British Boys Championship in 1953 and 1969, and the Scottish Ladies Junior Championship in 1967 and 1984. In 2001, one major result of the earlier Blue Circle plans was the chance it provided the Club, after over 140 years as a tenant, to acquire the prized course and transfer of ownership was finally completed in 2011. In recent years the Club has twice won the County Cup. In 1998 the winning team was Craig Grant, David Jubb, Neil Paterson and Bob Smith, and in 2001 Neil Paterson, John Archibald, Angus Massie and Stephen Easingwood repeated the feat. In 2007, their 125th year, the Dunbar Castle Club at last won their first County Cup. Not to be outdone, the Dunbar Golf Club in early 2008 won their fourth East Lothian Winter League title in a row. The demand for Dunbar as a host continues to the present day with the 2006 Scottish Ladies Close Championships, the 2007 Senior Open Championship final qualifying, the Ladies Home Internationals and the Seniors Home Internationals. In recent years members have keenly followed the fortunes of honorary member David Drysdale, a regular player on the European Tour. In 2009, David successfully reached the Open Championship and, in making the cut, outperformed Tiger Woods. Later in the year David joined forces with Alastair Forsyth to represent his country at the Omega World Cup at Mission Hills in China. Having reached the final of the 2011 Scottish Amateur Championship, rising star Danny Kay is hopefully set to follow David into the professional ranks. Currently underway is the Club’s most important development for over a century. Using a large tract of land beside the current second hole, the ultimate goal is to secure a new clubhouse location and build a modern practice range, golf academy, hotel and nine-hole course. Having entertained golfers successfully for over 150 years the Club continues a proud tradition. For the travelling golfer, Dunbar has always offered plenty of holiday accommodation, long sunshine hours and the warmest of Scottish weather. Easy access for rail and road visitors is complemented by increasing numbers of foreign visitors for whom the perils of the close proximity of North Sea’s lapping waters, the high walls of Broxmouth Park and the unpredictability of the local winds ensure a continuous battle for the golfer’s imagination. Today, Club staff and officials stand ready to offer both guest and member a more than friendly welcome, with fine catering in the clubhouse and the complete range of professional services at the pro-shop. 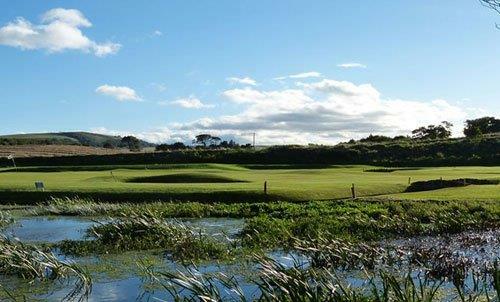 A golfing visit to this peaceful corner of East Lothian is always memorably rewarded.